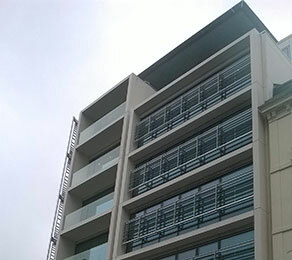 As a leading post-tensioning specialist, CCL was commissioned to design and install its full range of XF bonded flat-slab systems in this seven-storey office and retail building. The company designed the suspended horizontal floor plates on all levels, a total of 7,000m² installed. CCL’s main objectives of involvement were to increase floor-to-floor programme cycles, produce longer spans and maximise floor-to-ceiling space. The various levels of the building creates transfers at level four, six and seven with level six being the critical transfer level. Structural features, such as the incorporation of a full slab into the design, mean the tenant has the option of introducing a staircase opening of 4x4 m to combine levels two to five. Once CCL had progressed the original design, it was noted that on one of the levels the transfer loadings were significantly higher than anticipated, and the loadings therefore needed reassessing. CCL re-schemed the area, introducing upstand beams to transfer the loads back to the vertical structure.